Dr. Daniel A. Haber’s laboratory focuses on understanding the genetic abnormalities of cancer – from inherited mutations (with familial predisposition) to mutations that are acquired by tumors themselves – and the research aims to guide targeted drug therapies. Circulating tumor cells (CTCs) are tumor cells that have become detached from the primary tumor and enter blood circulation. Although rare, these cancer cells hold the key to understanding the process of cancer metastasis. Dr. Haber and his collaborators developed the CTC-iChip — an advanced micro-engineered device that captures these rare CTCs from the blood. Genetic testing on captured CTCs may give doctors a way to more effectively treat the tumor or stop it from spreading. Moreover, CTCs allow the response of treatments to be monitored in real time. The device could dramatically improve treatment and diagnosis for many different types of metastatic cancers, including metastatic breast cancer. Recently, Dr. Haber and his team made another discovery – this time regarding cancer drug resistance. They found that cultured CTCs from women with advanced breast cancer can switch on and off the expression of a key tumor promoting gene HER2, which makes them resistant to many drugs. The research suggests that drugs combatting both gene expression states should be delivered simultaneously to effectively treat advanced breast cancer. Dr. Haber’s work extends beyond breast cancer research. His lab is responsible for identifying a specific mutation in the epidermal growth factor receptor (EGFR) in a subset of non-small cell lung cancer (NSCLC). By linking EGFR mutations to lung cancer, Dr. Haber made it possible to identify patients who will respond well to certain cancer-fighting drugs that block EGFR mutations. In July 2015, the FDA approved the drug Iressa® as a front-line treatment for patients with these specific tumor mutations that Dr. Haber identified. The team is now developing technology to enable laboratory cultures of CTCs from patients with metastatic lung cancer, melanoma and other types of cancer. Success in this endeavor would open a new path toward predictive drug sensitivity and allow doctors to prescribe the most effective individualized regimen from the outset of treatment. Daniel A. Haber, M.D., Ph.D., is the Director of the Massachusetts General Hospital (MGH) Cancer Center and a professor of oncology at Harvard Medical School. He received his Bachelor and Master degrees from the Massachusetts Institute of Technology (MIT), and received a M.D. and Ph.D. from Stanford University School of Medicine. Following his schooling, Dr. Haber conducted his postdoctoral training at MIT and joined the Harvard Medical School faculty in 1991 as an assistant professor. Dr. Haber is most interested in the area of cancer genomics, including the study of circulating tumor cells, the Wilms tumor and genetic predisposition to breast cancer. 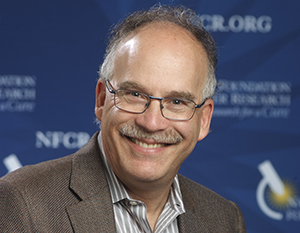 In addition to his award with NFCR, Dr. Haber is an elected member of the National Academy of Medicine, a fellow of the American Academy of Arts and Sciences, on the Board of Directors for the American Association for Cancer Research and a member of the Association of American Physicians and the American Society for Clinical Investigation. He is also on the editorial boards of Cell and Cancer Cell, and has served as genetics editor for the New England Journal of Medicine. Dr. Haber has been honored with a MERIT Award from the National Cancer Institute, the Emil Freireich Award from MD Anderson Cancer Center, Stand Up to Cancer Dream Team Award, a Dream Team Award from the Prostate Cancer Foundation, the Sternlicht Award from Case Western Reserve and the Hinda Rosenthal Award for Translational Research from the American Association for Cancer Research. Your ticket for the: Daniel A. Haber, Ph.D.